Technology has evolved so much now its very much part of our lives and who are as a person as we move from reality to the virtual world. Electronics have integrated into cars to relay information to the driver to make life behind the wheel simpler and safer. The modern car is become a more of tool in the transporting people from point A to B but to a MINIac its a place to call ‘Home’. The PlayStation was my ‘Home’ before I could drive. The PlayStation was my escape from the real world but I have grown up with every generation of this game console and remained a PS owner only. I would play endless of amount of PlayStation classic such as Crash Bandicoot, Metal Gear Solid, Wipeout, Driver, Tekken and most importantly Gran Turismo. Gran Turismo was my little nirvana of high octane adrenaline racing as I couldn’t reach the pedals at 11. In this world I could lose myself as I could go racing after completing B & A licenses for racing where you would start with a revtastic Honda Civic. That Honda was your stepping stone to learning the racing line and keeping momentum in the corners to catch up with the computer as often most you were up against faster cars but the AI back then wasn’t too clever. 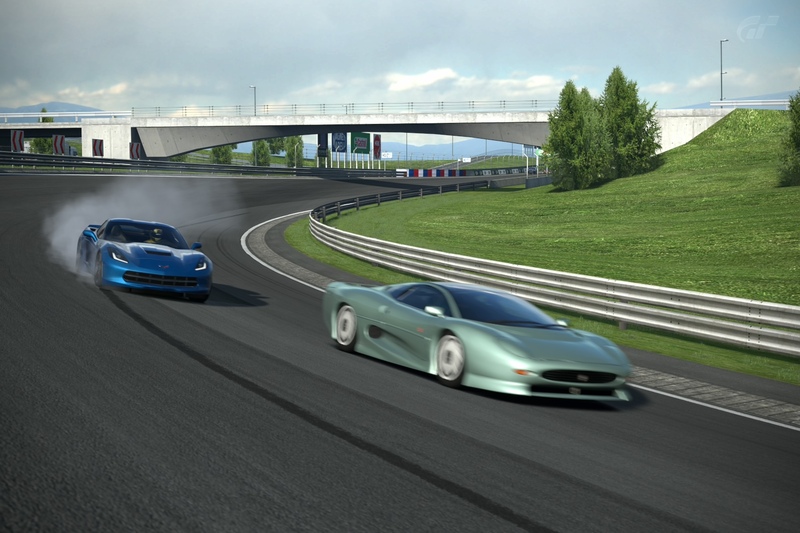 Fast forward to the future and the Gran Turismo series by Polyphony Digital since 1998 has sold over 72 million copies with the game its 6th iteration exclusively to the Sony PlayStation. 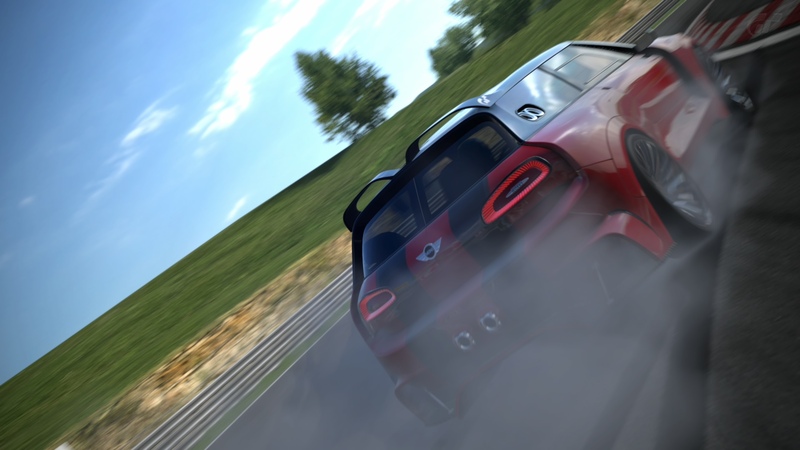 The brand has won the hearts and minds of gamers and petrol heads as it is still seen as the ‘Real Racing Simulator’ as the brand expanded into the real world. This first happened in 2002 where Gran Turismo creator and series producer Kazunori Yamauchi attended SEMA to judge exhibitors to give them a chance to have their car featured in a future version of Gran Turismo as a drivable vehicle. It didn’t stop with the after market world as GT brand was invited he prestigious Pebble Beach Concours d’Elegance to present the Gran Turismo Trophy – an award “to support those who make efforts to preserve irreplaceable, precious automotive culture for future generations to come”. This shows how the brand has very much come a big part of the automotive world in show scene but it doesn’t stop there with the GT series sponsoring the Pikes Peak, 24 Hours of Nurburgring etc. Kaz the game creator doesn’t shy away from racing in the real world either as he is through and through petrol head as he races in various championships under the GT brand with his most prominent being the 24 hours of the Nurburgring in a modified Nissan R35 GTR. Japanese manufacturers have often capitalised off the brand for marketing and tapping into future owners as they understood at some point these gamers will grow up to buy a car. Nissan has done this most effectively with Nissan Skyline which is now known as the GTR in its current R35 form. The official unveiling of the GTR was done in the real world and in the game at the same time giving the chance of the gamers to attempt the lap shattering record time on the Nurburgring of 7 minutes 28 seconds back in 2009. Nissan didn’t stop there instead it went straight after the players to start the GT Academy is a driver discovery/development program initiated in 2008 through a partnership between Sony Computer Entertainment Europe and Polyphony Digital. 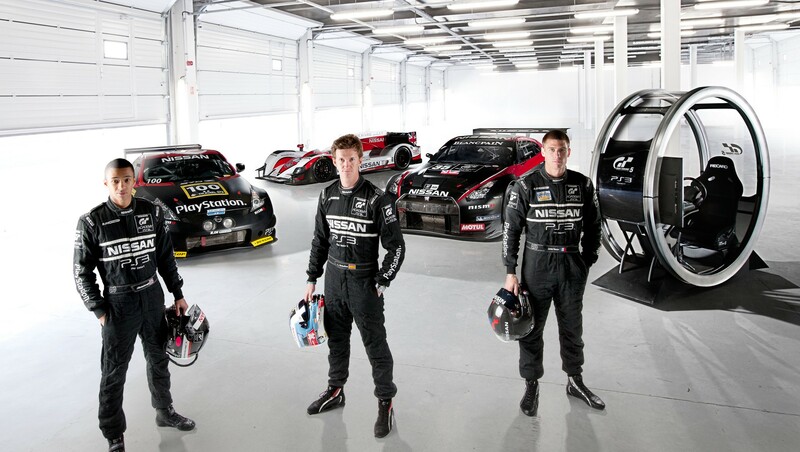 This was competition to see if gamers could be turned into real racing drivers to compete in GT3 racing series. The digital divide was truly broken as winners of the Gran Turismo Academy include Lucas Ordóñez, Jordan Tresson and Jann Mardenborough have all gone on to compete in professional real-life racing with great success. 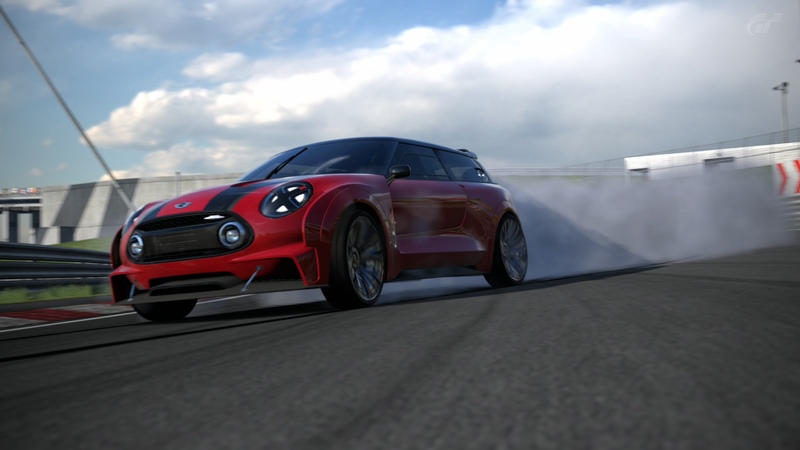 Taking the racing line back to MINI who have teamed up GT to unveiled the MINI Vision GT Concept which is essential the forth coming MINI Clubman in its JCW form. 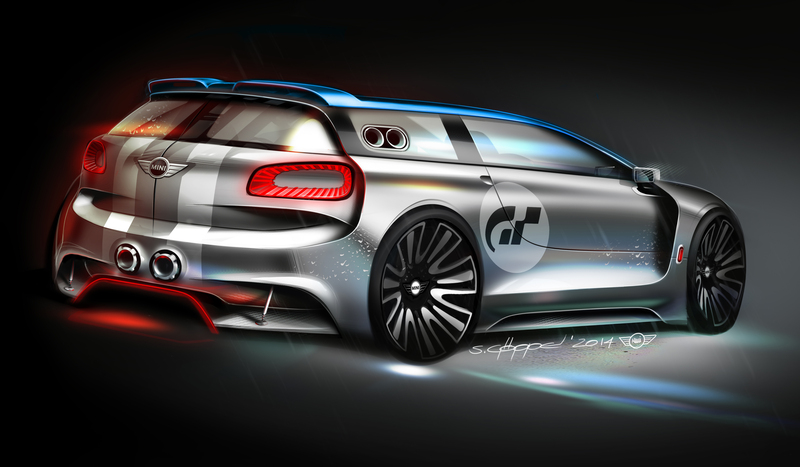 This digital concept is giving us an eye to where MINI will be taking the Clubman as the all engines, platform and JCW will provide. It was interesting to learn that this concept has a four wheel drive with 395 Bhp with 0 to 62 dispatched in 3.5 seconds. This MINIac has a sequential 6-speed transmission directs engine power to the permanent all-wheel drive system, guaranteeing optimum power transmission at all times, while gear shifting is achieved using wheel-mounted paddles. Fully adjustable dampers at the front and rear ensure an optimum connection with the road. The maximum speed is up to 290 km/h dependent on gear ratios. This is not the first time MINI has added four wheel drive to the mix the Countryman being the first with All4 with great success as the uptake has been significantly high which is why most likely the forthcoming Clubman will get All4. Looking at the concept there is a lot to like with the flared arches, front and rear carbon fibre splitters, roof spoilers and racing inspired black X headlights. The elliptical X headlamps are a hark back to the past of long-distance racers which masked their headlights to prevent the headlamp glass from splintering to avoid broken glass on the track. 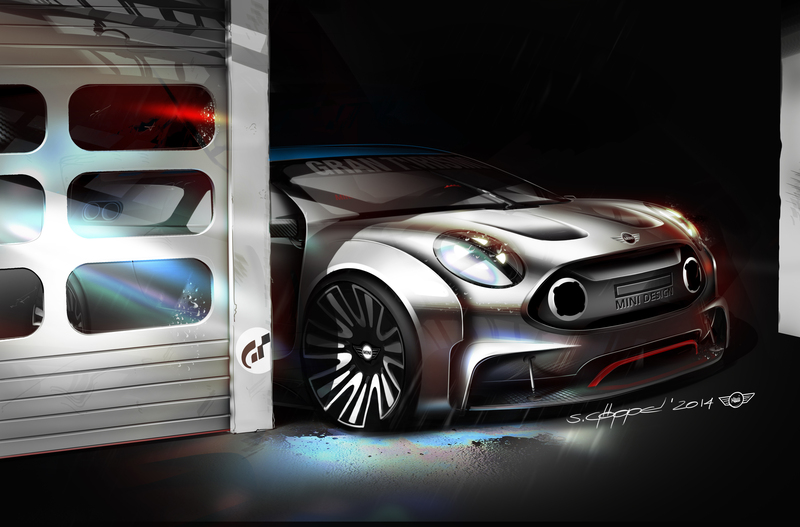 Sadly MINI didn’t give this concept an interior so there is no sneak peek into seeing the new Clubman interior. Looking at just makes me hope that MINI build a touring car version of this car to take racing as it would be great speculate to see MINI having David and Goliath battles to make its way to a podium finish. 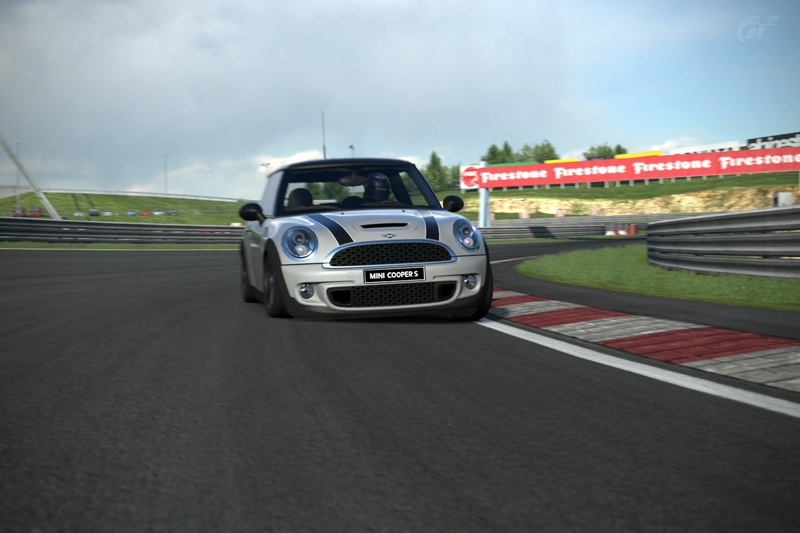 Given this a digital car only as of yet it would only be fair for me to test this MINI to its limits on track. Time to step into my bedroom for surreal review of the MINI VISION GT concept on my PS3 as for once I am not bonded by rules of the road. 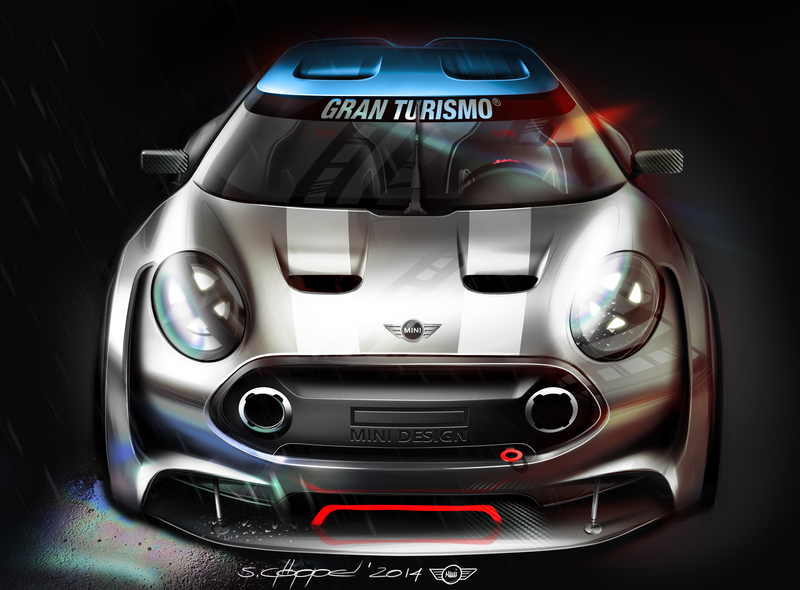 Rest assured I am no slouch in the digital world as the hours I have put into the GT series through the ages but this allows to me give a comparison with previous generation MINI model which are front wheel drive. You have been pre-warned as I do like to drift and tease the competition when I am winning which is quite often than most as I know my lines, I am patient and I know exactly when to make my move. 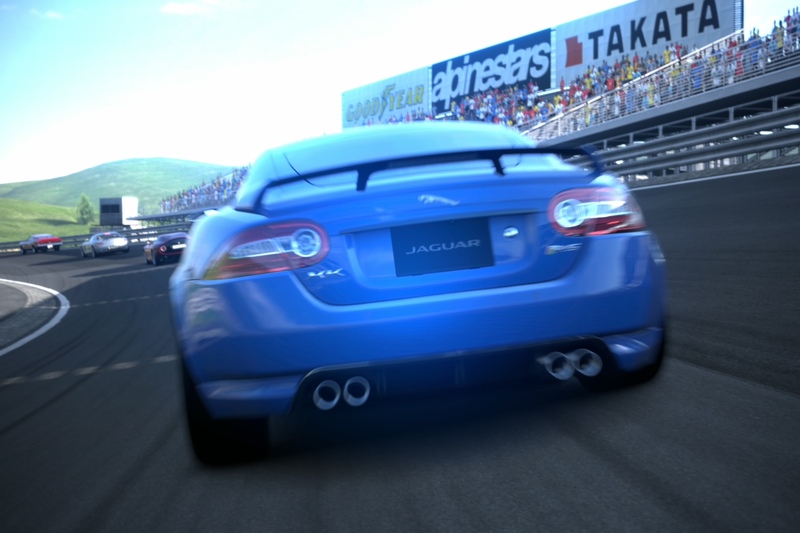 The track I selected to review this car is the High Speed Ring in GT6 as which is a well know track I know and often use to fine tune my car collection in the digital world. 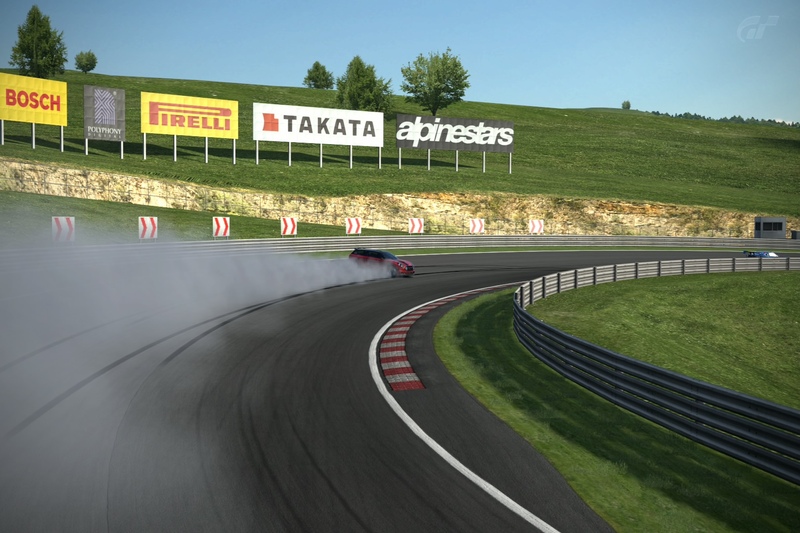 The High Speed Ring gives you a good indication of how the car is at speed whilst fast corners and S corners allow you see the grip levels and corner transitions the car makes under throttle, direction change and braking. This gives me a base line on how to fine to the power levels and suspension setup to dial in toe in and chamber or oversteer to my liking. With any race I do I always switch off the traction complete and just have the ABS set to normal to stop the brakes from stop locking up and gear changes are left in auto with opponents turned to the professional level. I opted to get the GT in the obligatory red and black JCW colours as this brought out the carbon details and key design features, there was no option to go DARK KNIGHT. I hit the GT’s original test track of the High Speed Ring and the GT concept doesn’t hang out on the back straight as we hit a high of 160mph going into the left high banked turn. There is alot traction from the four wheel drive but it seems to under steer when pushed hard as it refuses to turn as it just gentle turns giving you worrying moments of we are too close to the barrier. To quell the under steer you have to bring the speeds right down which is annoying when your racing as you have to opt for the slow in and fast out technique. The brakes are good and strong even with all the systems off as there is no squirming under heavy braking but again the four wheel drive system doesn’t allow any rotation or mid corner adjustments. This leaves a poor after taste which isn’t MINI go karting touch but some four ringed quattro numpty mobile as I expected a rear wheel bias on the four wheel drive system to give you some fun. I tried numerous techniques to get the back end to rotate or get any adjustments but it doesn’t allow you at all as did the Scandinavian flick, floored the accelerator mid corner and the only thing that did it was gripping the hand brake which would send into a 90 degree slide. The slide would be short lived as soon as you got onto the power to control it as the throttle would just as equally as violently bring the car back into the straight just to tell you ‘NO I AM NOT BUILT FOR FUN’. Through the S bend the transitions of the car was poor as direction change was soooo slow which resulted in quick slam on the brakes to get speed low enough to get more turn in. You had to be on the brakes the for the next corner otherwise it would just under steer into the barrier as the four wheel drive system doesn’t allow any rotation or adjustment which is why I had to adopt the slow in and fast out technique. 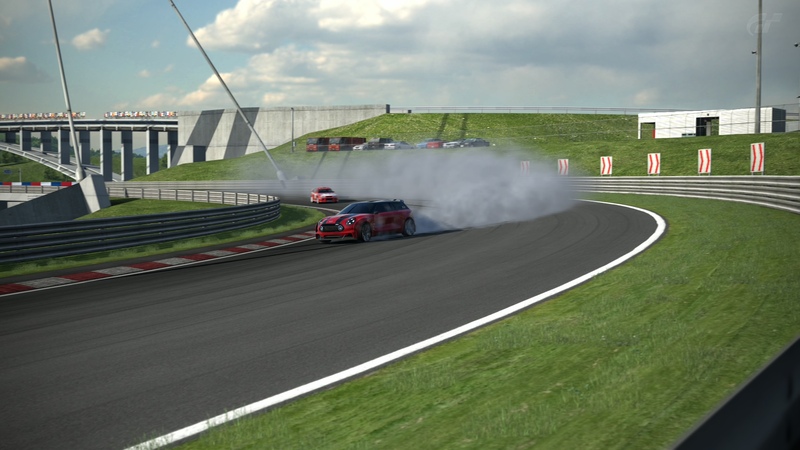 I posted a quick time of 1 minute and 9 seconds around the circuit which is league well above any hot hatch, MINIs have always punched above their weight and easily holds it own. However there was no enjoyment from this feat as it was more of relief when I saw the chequered line as I hated driving it. 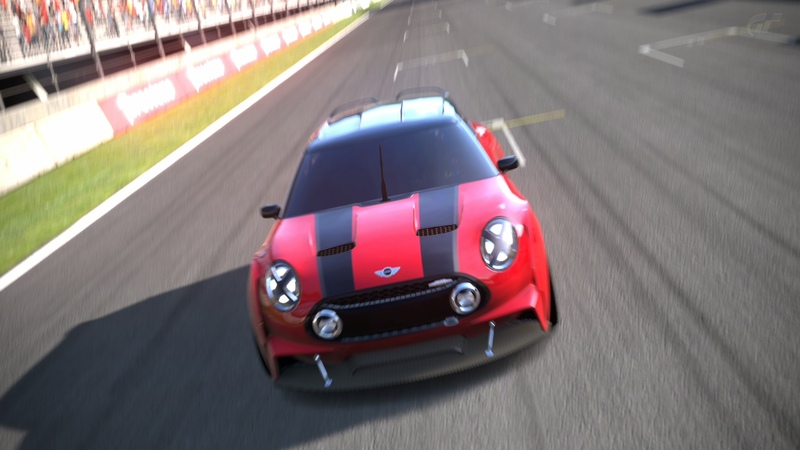 In comparison to a R56 MINI Cooper S specd to because race car level (coilovers, semi slicks, bigger brakes and uprated engine to 254 Bhp) is a whole 6 seconds slower at 1 minute 15 seconds but is whole load more fun as you point and shoot at corners. The driving experience is better in the front wheel drive R56 as I can adjust mind corner and have a better sense of grip levels but all considering the R56 power deficit of over 40 Bhp which makes a huge difference in such a small car. Looking at the overall benchmark of the VISION GT it holds own in the real world as I have lapped the circuit in completely stock Jaguar XKR-S at 1 minute 11 seconds and Murcia’s new C7 Corvette Z06 in 1 minute 8 seconds both wearing semi slick tyres with no electronic nannies. Both of these rear wheel drive powerhouses have at least 400 Bhp which just shows how much better MINIs are at putting the power to the ground and making the most of the corners. The VISION GT as race-car does what it was built for to post the best time lap time possible. It has achieved this to the sacrifice of the infamous go karting handling for outright traction with the four wheel drive system. 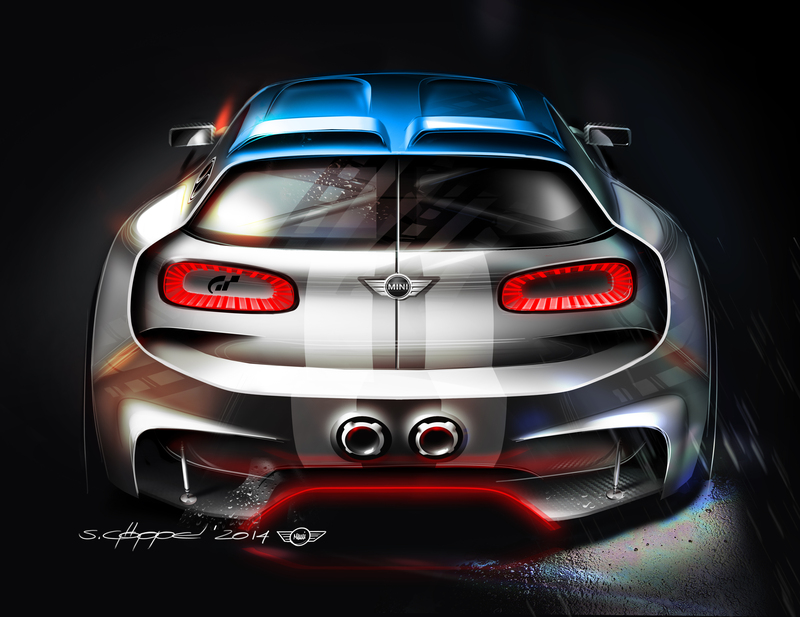 I am just hoping the forthcoming Clubman JCW gets the VISION GT racer look without the four wheel drive numbness. 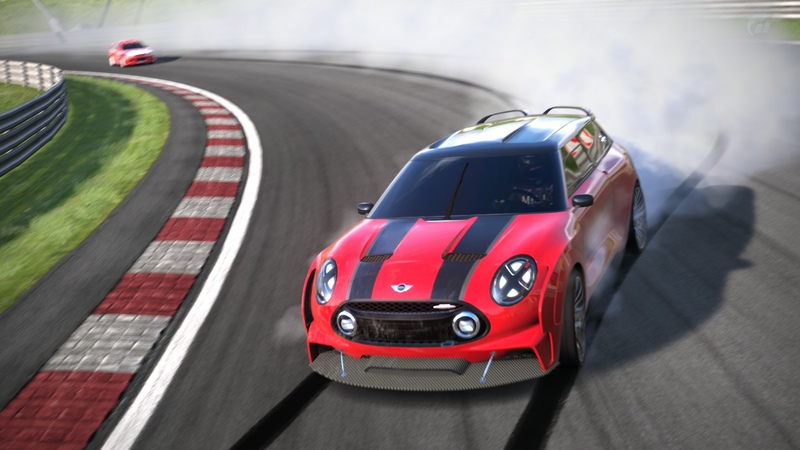 The VISION GT hits every apex as a race car but washes wide at retaining the MINI go kart handling at the price of four wheel drive traction. 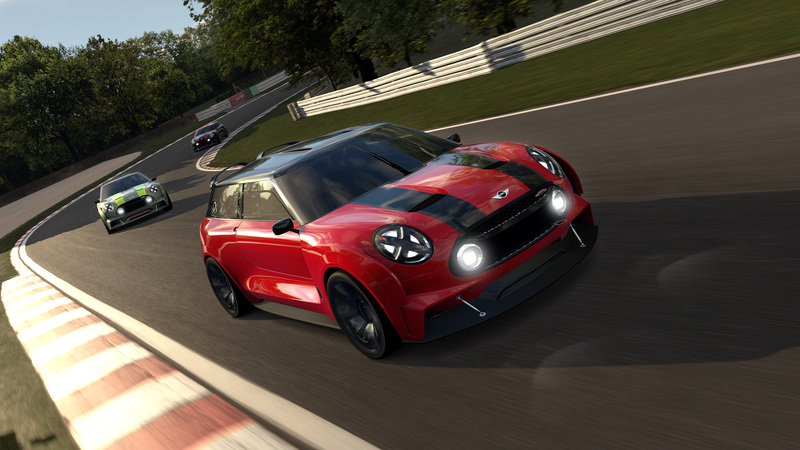 This might be a concept but many of MINI concepts aren’t far from reality to car you will own, meaning the forthcoming JCW Clubman will receive four wheel with more power and touring car looks.